I was very pleased with how this one turned out. In fact, I think it turned out better than I expected it to to be honest. I used some non-christmassy papers from Prima and lots of die cuts that I received from my friends. 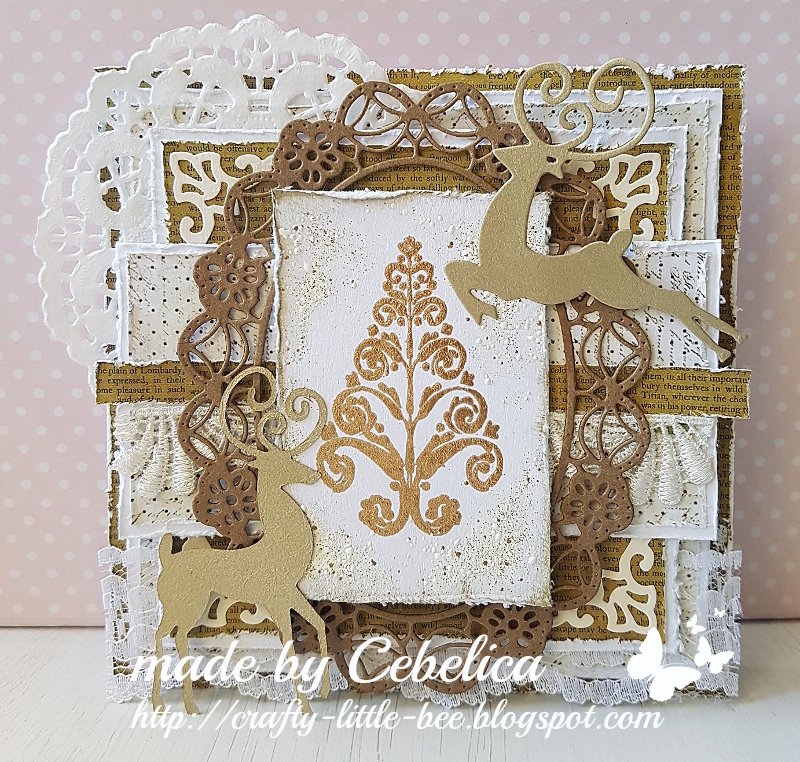 For the center of my card I used the beautiful Christmas tree rubber stamp which I embossed with Ranger's gold embossing powder. Around the image I sprinkled some frantage. Love that thing! I embellished the card with some lace. Layers are raised on foam pads, which give the card some dimension. Your card is gorgeous, Cebelica! I love the non-traditional colors, and love the layering. 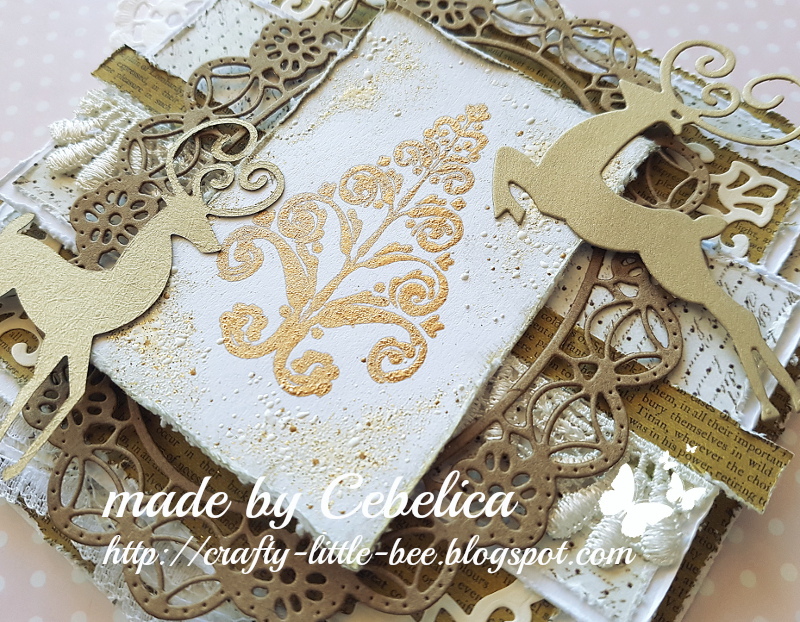 Your gold-embossed Christmas tree stamp with the Frantage is perfect! Thank you for sharing with us at Words2CraftBy! A beautiful creation for our 'Winter trees and flowers' theme at Stamping Sensations challenge, many thanks for joining in. This is lovely Cebelica. Thank you for sharing with us at Stamping Sensations and Happy New Year! What a gorgeous card! I love the layers and the color scheme you used! Thanks so much for linking this beautiful creation up to the Cropstop blog this month! Love the layering and details! So glad that you join the fun over Simon Says Stamp Wednesday “Anything Goes” Challenge! Awesome details and design! Super work! A beautiful creation for our winter trees and flowers theme! Thanks for joining us at Stamping Sensations and good luck! Hi Maja. Such a beautiful card! I am always so blown away to see your work in real life, it is even more gorgeous than in the photos. So many wonderful details, you really put the magic in my Christmas with your amazing creativity and kindness!! Absolutely beautiful! Love all of the texture and dimension! Thanks for sharing with us at Words 2 Craft By.